Step 1Wash hands before preparing feed. Wash and rinse cup or bottle and all utensils. Skimmed milk*, lactose*, vegetable oils* (sunflower oil, rapeseed oil, coconut oil), maltodextrin*, cream*, fructooligosaccharides (FOS), emulsifier (soy lecithin), sodium chloride, sodium L-ascorbate, magnesium chloride, ferric pyrophosphate, arachidonic acid (AA), L-cystine, potassium citrate, calcium hydroxide, docosahexaenoic acid (DHA), calcium carbonate, probiotics (Bifidobacterium infantis – contains 1 x 108 cfu/100g at time of manufacturing), DL-alpha-tocopheryl acetate, antioxidant (mixed tocopherols), zinc sulphate, ascorbyl palmitate, potassium chloride, tricalcium phosphate, sodium citrate, potassium iodide, nicotinamide, sodium selenite, calcium D-pantothenate, copper sulphate, thiamin hydrochloride, pyridoxine hydrochloride, retinyl acetate, manganese sulphate, folic acid, phylloquinone, D-biotin, cholecalciferol, riboflavin, cyanocobalamin. 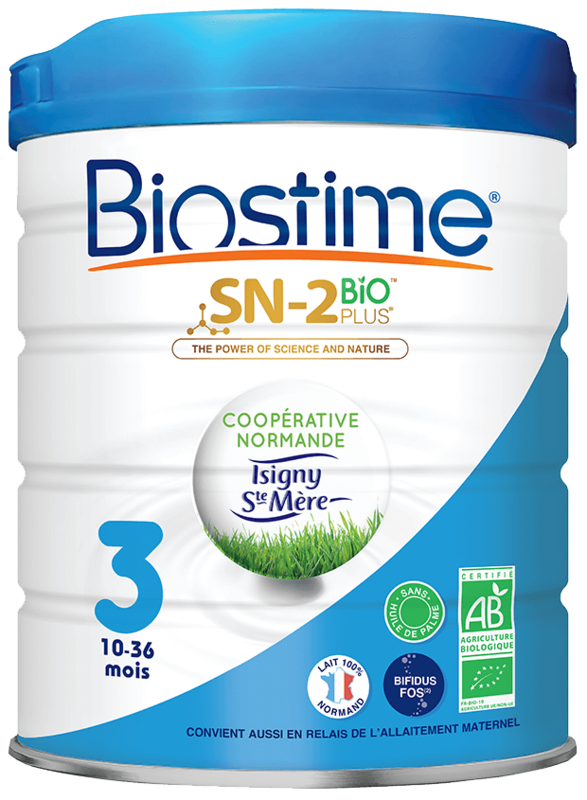 The protein source in Biostime® SN-2 BIO PLUS TM Premium Organic Growing-up Formula is derived from cow’s milk.